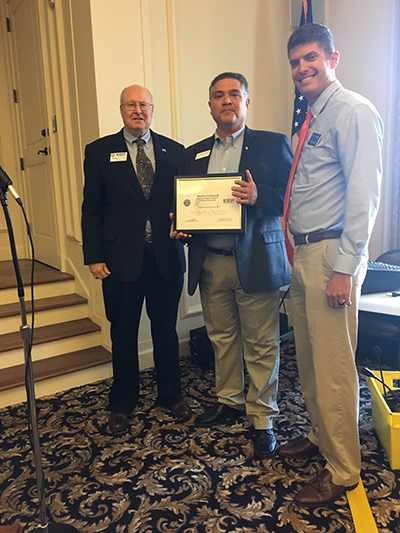 At the DNR Board meeting held on St. Simons this past Friday, Dominic was awarded the Patriot Award, which is given by the Department of Defense through the Employer Support of the Guard and Reserve Program. ESGR, was established in 1972 to promote cooperation and understanding between Reserve Component Service members and their civilian employers and to assist in the resolution of conflicts arising from an employee's military commitment. The Patriot Award reflects the efforts made to support citizen warriors through a wide-range of measures including flexible schedules, time off prior to and after deployment, caring for families, and granting leaves of absence if needed. Please join us in thanking both Dominic and JT for supporting our country.